For thousands of years people have been drawn to 'The valley of the Two Lakes' for its spectacular scenery, rich history, archaeology and abundant wildlife. The Glendalough Valley is located in the Wicklow Mountains National Park and has many attractions to enthral visitors. 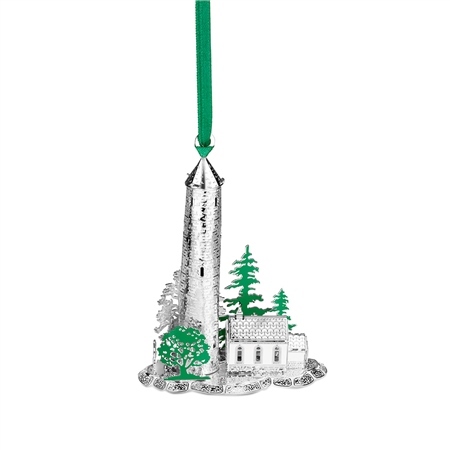 Inspired by the remarkable heritage and beauty of Glendalough, this Round Tower decoration incorporates the most distinguishing features of the original Monastic settlement; the monastic site and round tower. Silver Plated Round Tower decoration with a protective anti tarnish layer, presented in a Newbridge Silverware gift box. Product dimensions 60mm x 75mm.